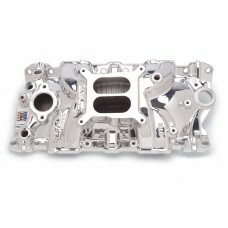 Performer intakes are part of the Edelbrock power package. The Performer package is designed to greatly increase performance and driveability in the low to mid-rpm range. This is the first level of increase over stock. The Performer package parts available include intake manifold, camshaft, carburettor and cylinder heads. This intake can be used in conjunction with other mild camshafts. This is the same manifold as EDEL2701 but has the Endurashine finish. Designed for street 1986 and earlier 262-400 cubic inch small-block Chevrolet V8's the Performer EPS dual-plane manifold is optimized to deliver superior performance when equipped with an Edelbrock carburettor. Dyno tests showed gains of 5hp and 9ft/lbs of torque over the Edelbrock Performer 2101 manifold. Will not fit 1987 and later Chevrolet heads – but will fit some Edelbrock and other 1987 and later aluminium heads. Recommended carb EDEL1404 or EDEL1405 for most mild applications. Manifold height A-3.74”, B-4.80”. Use intake bolt set EDEL8504.